Your 1918 half dollar value is $8.12 but quickly increases if your coin is in better than average condition. 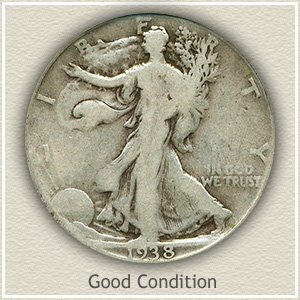 How well your old Walking Liberty half dollar has survived and the amount of wear evident determines if it is valued as a collectible or by silver content. Commonly found in heavily worn condition at which point the value of a 1918 half dollar rises and falls with the price of silver. However, your coin becomes very desirable to collectors and dealers if considerable detail remains. The coin pictured is exceptional, one that has never circulated and received any wear to its surfaces, and a silver half dollar valued above $645. 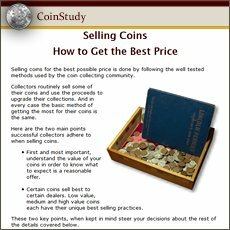 Images to compare your coin and judge its condition are further down the page. Also of importance is the mint that struck your coin, identified by a mintmark used by the various mints. The date, followed by the mintmark and finally, condition determine rare coin values. Discover how much your 1918 half dollar is worth. 1918 half dollars were produced in Philadelphia, Denver and San Francisco. The different mints are identified by mintmarks, "D" for the Denver mint and "S" used by the San Francisco mint. Denver mint coins have proven the elusive ones to find, and a nice treasure if yours is the "D" mintmark. Those without a mintmark where struck at Philadelphia. Examine the reverse along the rim at the eight o'clock position, if the mark is present it's small and occupying the space just under the branch. Stunning in appearance and value. 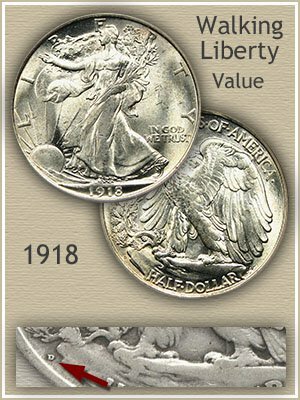 The rare 1918-D Walking Liberty half pictured was bid to a final price of $6,152 at a David Lawrence Rare Coin Auction. Stunning luster, the first impression is enhanced by surfaces free of wear and only a few insignificant abrasions. Early halves of the Walking Liberty series remaining today are commonly found with extensive wear. Special care is required over the years to preserve coins in high quality gem condition and few of the era received this treatment. Collectors now out number the few surviving gem 1918 halves and the opportunity to add one to their collection demands strong bidding. A determined collector now owns a prized silver half dollar with a combination of popularity, rarity and strong visual appeal. Accurately value your 1918 half dollar by comparing to the grading images and finding the closest match. Values depend on determining your coin's condition, collectors judge old silver half dollars carefully before deciding how much they are worth. 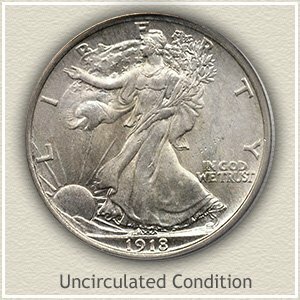 Uncirculated: If your coin was put away long ago before any wear from circulation took place it is in "uncirculated" condition and at the top of 1918 half dollar value. Typically toning has begun to cover parts of the coin, but the original luster is unbroken by wear. Examine Liberty's outstretched arm and rear leg, if the luster is missing because of wear, indicating the coin is circulated, these areas appear dull. 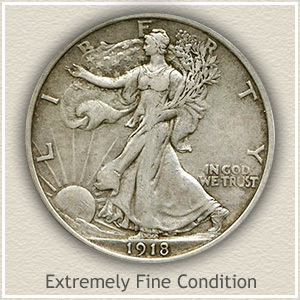 Extremely Fine: Evidence of some wear but remaining bold is a coin in "extremely fine" condition. Showing the greatest amount of design loss is the area through the center of Liberty. Folds in her gown have worn smooth over the area of her leg. Once rounded features, the branches, sun rays and Liberty's face now are flattened slightly from circulation. 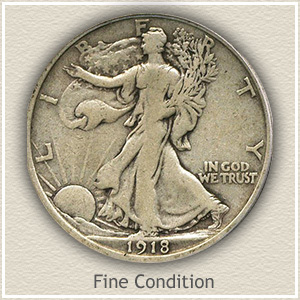 Fine: As the Walking Liberty half circulates a thin unbroken line with complete loss of detail develops extending from Liberty's head to her foot above the date. Such a coin is in "fine" condition. Recognizable are the branches in her arm, and folds in her gown, there is still a depth to Liberty's figure. Good: Heavy wear and overall flatness to the coin define the "good" condition. Rims have begun to connect to the tops of the lettering and starting to obscure the date. Areas of "In God We Trust" are becoming faint. The center of Liberty is flat with no details. In this condition the typical 1918 half dollar value is based on silver content. Return to Coin Values Discovery... find 1918 half dollar value and... It is an excellent reference list with images and text links to all US coin series, from Cents to Gold. Value charts are combined with grading images and descriptions to uncover the wide range of common to rare coin values found in your box of old coins. Silver half dollars are collected in a wide range of conditions, from the high priced gems to pleasing circulated examples. The Walking Liberty half dollar series is avidly sought by collectors and rare coin dealers. Judge your coins with grading images and determine condition. 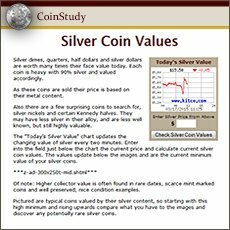 Value charts list all date and mintmark combinations leading to an accurate value of your old rare coins. Many rare and valuable coins are found throughout the entire history of silver half dollars. Spanning 1794 through the 1960's discover how much these rare silver coins are worth. The Franklin series of half dollars, Barber, Seated Liberty and the early Bust half dollars are listed by date with values.